AR-401 is a mAb discovery program to treat infections caused by the Gram-negative bacterium Acinetobacter baumannii. This opportunistic pathogen affects highly vulnerable patients, such as those in intensive care units (ICU). This bacteria causes a variety of infections such as pneumonia, bacteremia, wound infections, urinary tract infections, and meningitis. The prevalence of A. baumannii pneumonia is rising, particularly in mechanically ventilated ICU patients where it is associated with a mortality rate of 43% and an average increased length of ICU stay of 15 days. More than 36% of clinical isolates of A. baumannii are resistant to carbapenems, one of the last-line antibiotics used today. 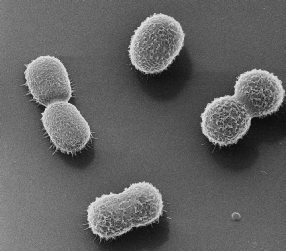 The emergence of multidrug resistant A. baumannii isolates has emphasized the need for novel therapeutics to fight A. baumannii infection. Aridis scientists have identified eight novel putative anti-A. baumannii drug targets, all of which are highly conserved across different clinical isolates, screened A. baumannii infected patients for rare B-cells producing potent monoclonal antibodies, and selected a number of leading mAb candidates directed against the novel putative targets on A. baumannii. AR-401 is currently in preclinical development.